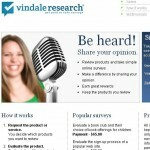 Vindale Research by Vindale Media LLC, found at vindale.com, is a market research website that uses the GPT model, or, get paid to model, that offers surveys and product testing trial offers. At press time, only U.S. surveys and offers are available but they are expecting to expand their paid surveys program. Its free to join and they pay cash via PayPal. However, there are so many complaints registered about Vindale Research in regards to payments and other issues we will examine here. Vindale Research’s website has a more professional look to it. Even the most experienced expert might be fooled by its legitimate appearance and misleading claims that there is a huge chance of making money and getting useful free products. Their so called trials are the typical spam offers you get in your email spam box, yet Vindale Research’s way with words makes the offers seem like more than the junk it really is. Once you click on most offers, they take you through an excruciatingly never ending inundation of pages full of other questions and offers that have nothing to do with the survey you chose to take in the first place. It keeps going until you realize it’s just a bait and switch con and you may never get your chosen survey study in your lifetime. Most of those questions have to be answered in order to keep going. It is a very serpentine and sneaky way of confusing you and getting you to sign up for offers you didn’t want, for one. For another, this tactic Vindale Research uses is a way of spreading the personal info you gave them when you joined. This is also a way they get more revenue, by selling your information down the river, so to speak, to their third party clients that post those pages and pages of links to trial offers. This is where the potential danger lies. Although the offers Vindale Research says you choose may state how much you will make, there is no guarantee you would complete the study. However, there is a catch that can get you into potential financial trouble. Even if you do finish Vindale Research’s studies, most of the offers insist on you giving out your personal contact details and credit card information to their third party clients even with 30 day “free” trials. They thrive on the hopes that you forget to cancel the trial in 30 days so they can bill your credit card without your authorization. Even if you really do get paid for finishing a study from Vindale Research, you will be spending more money than you’re making by paying for the junk they want you to try out. Most survey companies don’t really pay much in short periods. In fact, most people who really try at it might make around $300 or $400 over the course of a year’s time. That to me just does not seem to be worth the trouble, but Vindale Research will actually leave you in the red over time instead. It’s just better to pass up Vindale Research and pass it up in a hurry. It may not be a scam, since it is free to join, but there’s no way I’m recommending Vindale Research.